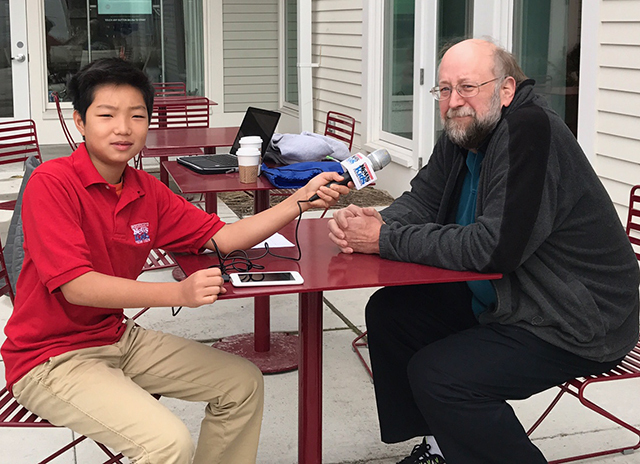 A Heated Sanctuary City Debate | Kid Reporters' Notebook | Scholastic Inc.
Stone interviews Acton resident Allen Nitschelm. Since President Donald Trump took office on January 20, he has attempted to temporarily ban the entry of citizens from several Muslim-majority countries. The legality of the travel ban is now being debated in the courts. Meanwhile, the Trump administration is enforcing immigration laws more aggressively, targeting undocumented workers from Mexico and other Latin American countries. Trump is also threatening to build a wall between Mexico and the United States to discourage illegal immigration. Political leaders around the country are debating whether or not their cities should become “sanctuary cities.” These cities limit cooperation with the federal government in enforcing immigration laws, in an effort to protect people who may be vulnerable. The president has threatened to cut federal funding to any cities that do not enforce such laws. People in Acton, where I live, are debating the pros and cons of offering a place for immigrants who may fear being deported. Many people believe that undocumented workers and their families have a right to stay in the U.S. if they are contributing to the economy and not causing harm to others. Allowing these immigrants to stay could also improve the quality of life. Residents express support for making Acton a sanctuary city after President Trump’s temporary travel ban. “The police think it makes the town safer if you don’t ask about immigration status in minor situations like traffic violations,” said Peter Berry, a member of the Board of Selectmen in Acton and a former attorney. Lingya Zhou, who is from China, pointed out that laws targeting undocumented workers can affect all immigrants, even those who are in the U.S. legally. The residents of Acton have decided to postpone a vote on whether or not to become a sanctuary city. Until then, the debate is likely to continue.